Quiz Competitions, Drawing Competitions, Poster Competitions, Science Fair Competitions 2017 under World Space Week Celebrations 2017 for school students. Quiz, Drawing, Poster, Science Fair Competitions for school students under ISRO World Space Week Celebrations. Quiz, Drawing, Poster, Science Fair Competitions Themes 2017. 4th to 10th October 2017in selected places of Andhra Pradesh, Telangana, Tamilnadu and Odisha. 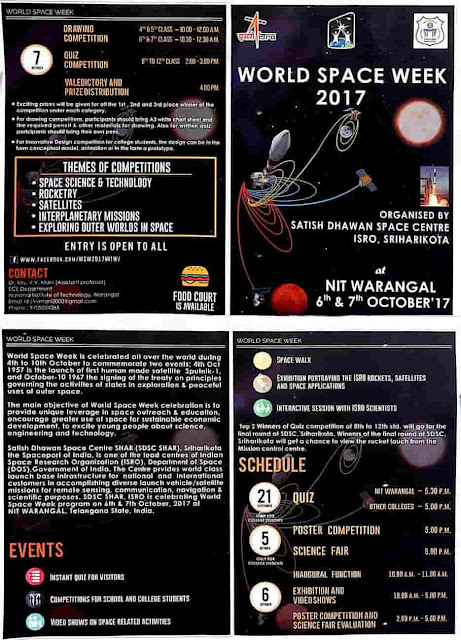 For the Telangana region, SDSC will be organizing this "World Space Week 2017" at NIT Warangal during 6th and 7th October 2017.The main motive is to inculcate the benefits of Indian Space Programme to majority of scientific, academic and general public. For the success of the event, the Director of NIT Warangal Prof. G. R. C. Reddyhas agreed to extend his support by providing all the facilities available at NIT Warangal. During these two days, several events as listed will be conducted at NIT Warangal by SDSC to stimulate the young minds and to reap benefits for future generations. 1. Quiz and drawing competitions with the theme "Space Science and Technology, Rocketry, Satellites and Interplanetary Missions". 2. Poster Competition with the theme "Exploring Outer Worlds in Space". 3. Science Fair with the theme "Space Science and Technology". These competitions are open to different categories of students ranging from school level, Intermediate level and engineering graduate level. All the top winners will be awarded prizes by SDSC. For further details, contact vvmani@nitw.ac.in & 8332969365. శ్రీహరికోటలోని ఇస్రో అంతరిక్ష పరిశోధన కేంద్రం ఆధ్వర్యంలో అక్టోబర్ 6, 7తేదీల్లో నిట్ వరంగల్ వేదికగా ప్రపంచ అంతరిక్ష వారోత్సవాల్లో భాగంగా రెండు రోజుల పాటు ప్రదర్శన నిర్వహిస్తున్నారని వరంగల్ అర్బన్ జిల్లా విద్యాశాఖాధికారి సున్నం శ్రీనివాసచారి పేర్కొన్నారు. ఇందులో భాగంగా స్పేస్ ఎగ్జిబిషన్ ఏర్పాటు చేస్తారన్నారు. జిల్లాలోని ప్రభుత్వ, ప్రైవేట్ పాఠశాలల విద్యార్థులకు సంబంధిత అంశాలపై ఎగ్జిబిట్ ప్రవేశ పెట్టే అవకాశం ఉందన్నారు. అందరికీ ఉచిత ప్రవేశం ఉంటుందన్నారు. పోటీల్లో పాల్గొనే వారు 83329 69365 గల సెల్ నెంబర్‌లో సంప్రదించవచ్చని డీఈవో పేర్కొన్నారు. All the DEOs in the State are hereby informed that "World Space Week" will be celebrated from 4th to 10th October, 2017, which is an important International event celebrated since 1999. On this occasion the ISRO has planned a two day event at Employee, Development Center, NTPC, Ramagundam on 8th to 9th October, 2017. The event covers exhibition of ISRO Launch Vehicle and Satellite Model, video shows on space related activities and competitions for school and college students. Similar event has been planned at NIT, Warangal in association with SDSCSHAR, Sri Hari Kota on 6th and 7th October, 2017 which is already communicated to all DEOs vide reference cited. Dr. V.V.Mani, Asst. Professor, ECE, Department. NIT, Warangal, Mobile: 08332969365; E-mail: vvmaniPnit.ac.in. In Hyderabad, the National Remote sensing Center is organizing the week from 4th to 8th October, 2017 with a theme "Exploring New Worlds in Space" at their outreach facility, Jeedimetla and Balanagar Campus. They are organizing exhibition comprising digital displays, video clipping, live demos and models and interaction with ISRO scientists. i) Ms. K. Swarupa Rani, Scientist, NSRC. Cell No. 040-23884596.
ii) Aparna. N. ; Group Head, NRSC, Data Center, Dept. of SPACE, ISRO, Balanagar, Hyderabad. Mobile: 9440396444; Office: 040-23884423. Therefore, all the DEOs are requested to communicate the above said information to all the Secondary Schools under your jurisdiction and instruct the concerned Headmasters to take necessary steps to identify the interested students and teachers to participate in the said even at respective nearby centers. SCERT Telangana-Rc.No.162, Dated: 23-09-2017 :: Sub:SCERT, Telangana, Hyderabad - World Space Week Celebrations - 6th - 7th October 2017 at NIT, Warangal - Reg. Ref:- Mail Dt. 19-9-2017 from Dr. V. V.Mani, Asst. Professor, ECE Department, NIT, Warangal. All the District Educational Officers in the state are here by informed that, Asst. Professor, ECE Department, NfT, Warangal is informed that Satish Dhawan Space Centre (SDSCSHAR, Srihari Kota) is conducting a two day "World Space Week" during 6- 7th October 2017 at NIT, Warangal. As part of the programme ISRO is exhibiting their rocket launching, Satellite and other space related models in NIT, Warangal for public awareness. 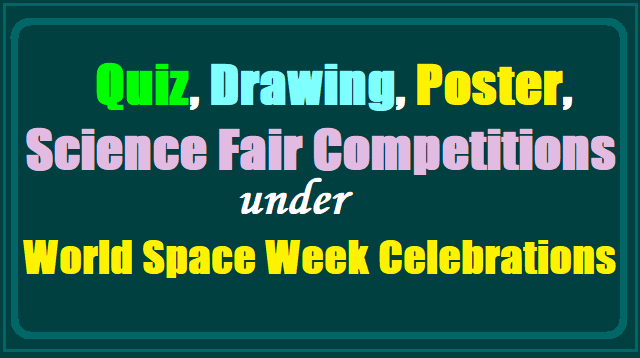 Quiz and drawing competitions with the theme "Space Science and Technology, Rocketry, Satellites and Interplanetary Missions"
Poster Competition with the theme "Exploring Outer Worlds in Space". Science Fair with the theme "Space Science and Technology". All the top winners will be awarded prizes by SDSC. For further details, contact vvmani@nitw.ac.in &8332969365. Therefore, all the DEOs are requested to communicate their information to all secondary schools in the state and take steps to identify the interested students and instruct the HMs to make arrangements to participate in the 'World Space Week' during 6 - 7th October 2017 at NIT, Warangal. Encl: mail and schedule of events.